The first artifact that caught my attention was the “Lace Headdress and Skirt”. It was made in Oaxaca, Mexico before 1954. There is no designer or creator, but this is a typical dress for that area so the design dates back decades and it was probably made from someone in the state. The fabric is Machine-made lace, cotton, and ribbons. The first thing I noticed about this dress was these metal flowers worn on the head. This dress was said to be used for church, weddings, and processions. It conforms with the beauty standards for that time period and what was expected from women at the time. 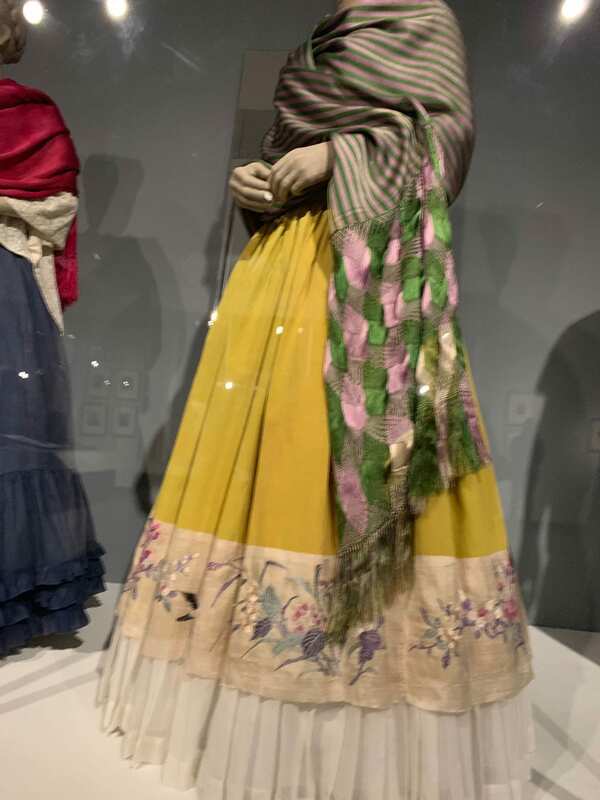 This dress shows that Frida, not only wore her Mexican style clothing as a fashion statement, but also to show her heritage given that her mother was also from Oaxaca. Personally, this dress does remind me of the state of Oaxaca in Mexico. Although most people do not dress like this in their day to day life, this clothing style can still occasionally be spotted outside of churches before or after a wedding ceremony. The dress caught my attention with its big head piece. That style is said to derive from an accidental shipment of baby clothes from Europe that native Mexican women chose to wear on their heads due to the small size and high quality materials. This was explained in a video playing at the gallery. 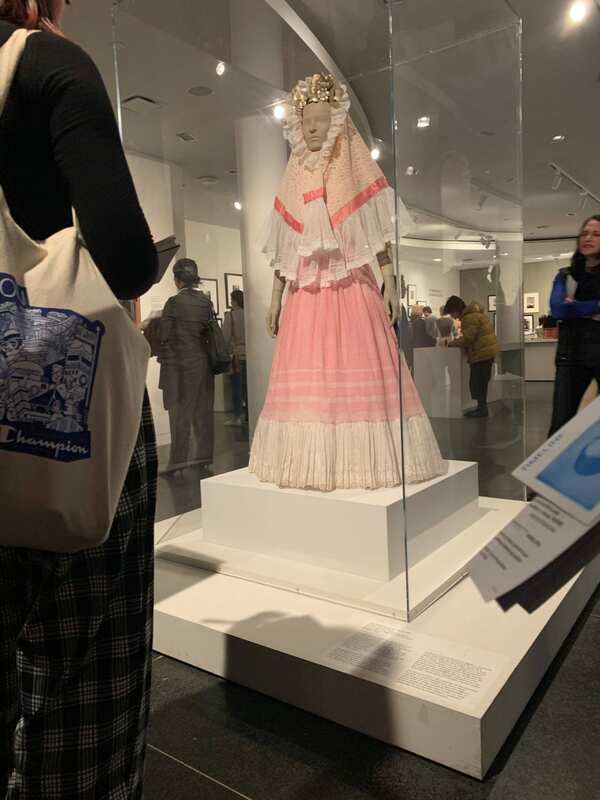 It was also intresting to see the layers and how they all worked together to make this tehuana dress. Lastly, on a personal level, I have always been self concious about my height and seeing that Frida Kahlo was also small was nice. Next, a set of ankle boots was a piece that stood out to me. They were made in Coyoacan, Mexico around 1948-52. They were a personalized gift to her from poet Pita Amor and Olga Tamayo, the wife of artist Rufino Tamayo. They are made from satin, leather, metal and glass. The first thing I noticed about these boots was the fact that they were uneven. One was higher than the other, this is probably because of Frida’s many back problems which caused one leg to be longer. This pair of boots transforms notions of beauty by embracing the unordinary aspects of her appearance and making boots that show the uneven legs. 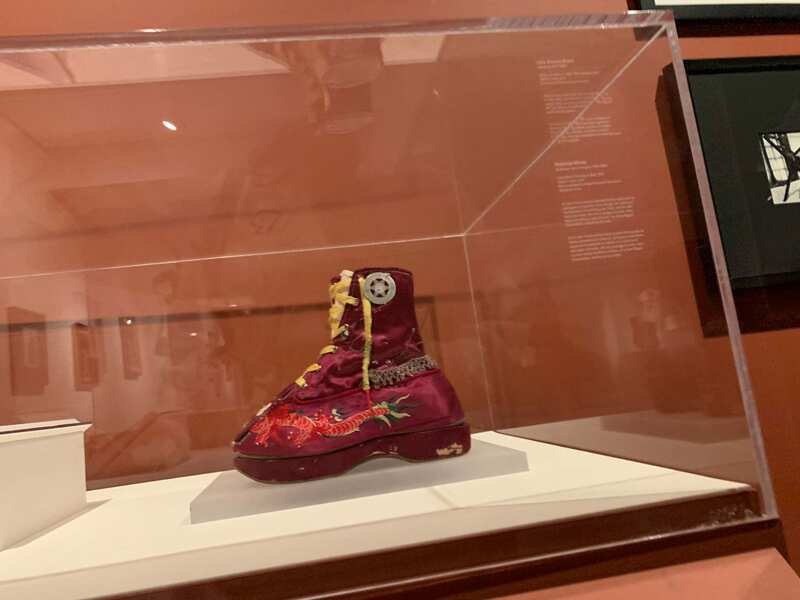 The boots showcase who she was, with the loud color and embroidery and also shines a light on how she needed to adapt her clothing to fit not only her personal style but her body. I was drawn to these boots because I think they might have been the only shoes in the exhibition. 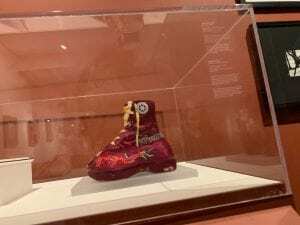 I am a huge fan of Frida Kahlo and have seen the majority of painting and belongings and this was the first time I have gotten to see her shoes. The bright red satin of the boots and their clunky appearance made them truly one of a kind. You could tell they were made to be far from ordinary and they remain that way even today. This necklace is one of a kind. It was made by Frida Kahlo herself. It is called “Necklace of Obsidian Blades”. It was made in Mexico, most likely in her home or studio before the year 1942. In the Mayan culture these blades where used as weapons. The intresting thing about the necklace was that the blades had not been drilled through but rather held tightly together with string. I was unable to get a picture of the necklace but the string was red and the blades were very sharp. I really liked it because it was made by her. I really enjoyed how she had created that for herself. I would like to believe Frida chose this stone because of the connection to the Mayans and trying to embrace her Mexican culture and heritage. It is a necklace that today would be called statement jewelry and would not be abnormal to wear in my opinion. I appriciated it because it was held together in an out of the box way and was probably labor intensive to hold the pieces together using just string. For my fashion object I chose one of her spine braces. 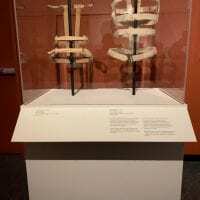 It is called the ” Taylor Spine Brace” and was made in 1945 in the United States. It is made from leather, metal and fabric. 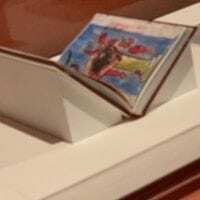 For the art object, I chose her sketchbook made by Frida Kahlo in the years 1944-59. The materials listed were ink and paper. Not only does does it line up with the years for the brace meaning they coexisted in her life, but they show the pain in her life. The sketchbook is open to a seemingly grusome page showcasing her on a bed of some kind with blood. The brace was a part of her life due to all her accidents that left her with a horrible pain. The drawing shows how she saw herself and the brace lets us know that her pain was real and had to be dealt with medically on a daily basis as well. To me, Frida Kahlo is an inspiration. We are both Mexican as well as having a complex family and cultural history. She was also very proud of her culture and so am I. She was a painter and loved expressing herself through clothes. Although her medical history differs from mine, we both overcame medical problems on a daily basis. Seeing this show was amazing. I am a huge fan and have been to all her museums in Mexico as well to many of the exhebitions wherever they are. Her quotes line my walls and have always been a source of strenght for me. On this experience I got to see a quote that roughly translates to ” Here in the US I live my life dreaming of being in Mexico, New York is pretty but I still miss Mexico”. This is a quote that resonates with me because my mom says them to me everyday. When I saw it I immidiatly texted her and we laughed about it on the phone. The more I grow and learn about her, the more I relate. I loved the show and I would go again!